ShineBid equip your team with the skills and insight to develop winning bids routinely. We take the stress out of learning by delivering bespoke gateway bid training courses at your offices or an off site venue to ensure we reach your entire team. 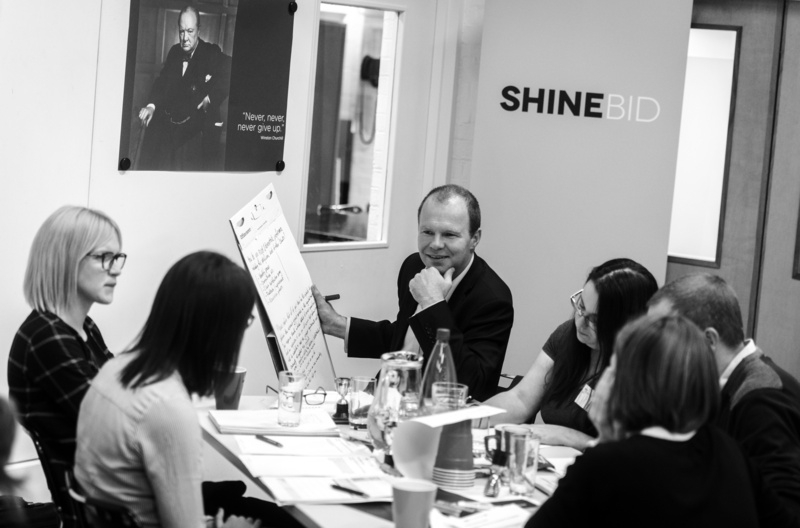 ShineBid works with your brief, assess team skills, processes and previous bids to develop your tailored course content. Delivered by our expert bidders the training will ensure you get tried and tested learning and results. equip your team to be consistent bid winners. Do you often find yourself thinking the below? No two businesses bidding challenges are the same and that’s why we offer tailor-made bid training courses to address your particular challenges and weak spots. We design and deliver a bespoke training programme, tailored to the needs of your team and your requirements. You participate in activities aligned to your current bidding circumstances so that your teams can apply what they learn immediately and in a context relevant to them. Delivered by successful bid practitioners and expert trainers. Shine Bid is one of the UK’s leading bid management companies. We have won $10 billion in RFPs, bids and tenders since 2008. Our training courses are designed to equip your teams with practical skills and insight to take their bidding to another level and increase your win rate. A training take way pack and recommendation report provide you with the tools to put the learning into practice across your business.